I've been wanting to do croissants for some time now but never had the time until now. As I had some vacation holiday to clear from my work, I decided that this was the right time to try and tackle this recipe. 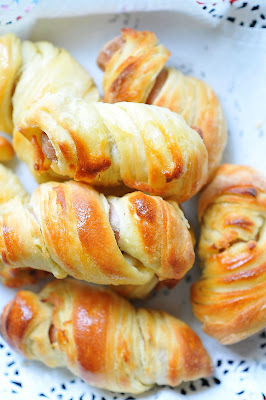 Instead of making plain croissants, I adapted this recipe by wrapping some chicken sausages in-between the dough as my husband said he would rather have something savoury instead. 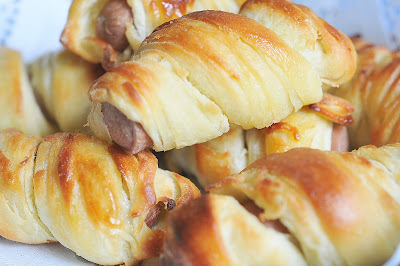 I rolled the dough into a strip and twirled it around the sausage. The dough can be made beforehand and frozen until you are ready to bake them. It's really not that difficult but rather time consuming. I also had a bit of trouble with the butter block as the butter oozed out whilst I was doing the turns. I thus had to refrigerate the dough more times than would have normally required. However the end result was a batch of delicious sausage croissants hot from the oven. 1) Sprinkle 3 Tbsp flour over butter and blend together on the work surface. On a length of foil, fashion a 6" square of soft butter; fold over the sides of the foil to enclose. Place in the refrigerator to chill for 2 to 3 hours. 2) While the butter is chilling, prepare the dough. To mix by hand, in a large mixing or mixer bowl, blend 2 cups of the flour with salt and sugar. Dissolve yeast in warm water and add it and the warmed milk and half-and-half to the flour mixture. Stir with a wooden spoon or the flat blade of an electric mixer to thoroughly blend the batterlike dough, about 2 minutes. 3) Stir in additional flour, 1/4 cup at a time, to make a soft but not sticky dough (it will stiffen when chilled.) Knead by hand or under a dough hook for 5 minutes to form a solid mass. 4) If using a food processor, attach the steel blade. Place 2 cups flour in the work bowl and add the dry ingredients. Pulse to mix. Pour the 1/4 cup water, milk, and half-and-half through the feed tube. Pulse once or twice to be certain that all dry ingredients are moistened. Add the balance of the flour, 1/2 cup at a time, turning the machine on briefly after each addition. When the mixture forms a mass and begins to clean the sides of the bowl, knead for 30 seconds. Don't overknead! 5) This begins the process of cooling the dough and at the same time allowing it to rise. Cover the bowl with plastic wrap and place in the refrigerator for at least 1 hour. 6) Determine that both butter and dough are about the same temperature — 65°F (23°C) is ideal. The block of butter should bend but not break (too cold) nor be oily (too warm) when bent slightly. This may mean taking the butter out of the refrigerator an hour or so early to reach workable temperature. Likewise for the dough. Place the dough on a floured work surface and with the hands press it into a 10" square. Unwrap the block of butter and lay the block diagonally on the dough. Bring each point of dough into the center, overlapping the edges at least 1". Press the dough into a neat package. With a heavy rolling pin, roll the dough into a rectangle, approximately 8" x 18". This dimension is not critical. Caution: If the butter seems to be breaking into small pieces under the dough rather than remaining solid, allow the dough/butter to warm a few minutes. But if the butter softens, becomes sticky, and oozes while making the turns, put the dough back into the refrigerator for several minutes. 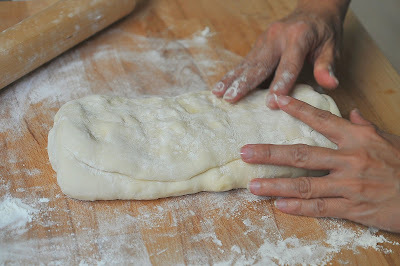 7) Fold the length of dough into thirds, as for a letter. Turn so that the open ends are at twelve and six o'clock. Roll again into a rectangle. This time, fold both ends into the middle and then close, as one would a book. The dough will now be in 4 layers. Wrap the package of dough in a cloth (an old tea towel is good) that has been soaked in cold water and wrung dry. Place the wrapped dough in the refrigerator to relax and chill for 1 or 2 hours. 8) Remove the dough from the refrigerator and place on the floured work surface. Unwrap, roll out, and fold in thirds, as for a letter. This is the final turn before it is rolled out and cut into croissants. Dampen cloth again and wrap loosely around the dough. Place the package in a plastic bag so moisture will be retained (not pulled out of the cloth). Leave in the refrigerator 4 to 6 hours or overnight. 9) Mix together the egg and 1 Tbsp of water. Have ready the egg wash, a knife or pastry cutter, and a wooden yardstick if you wish the pieces to be cut precisely otherwise, plan to cut them freehand. You may have or can borrow a French croissant cutter that cuts the dough into triangles. 10) Sprinkle work surface with flour. Roll the dough until it is a generous 10"-x-38" rectangle, and, most importantly, about 1/4" thick. This is a crucial dimension, since it determines the size and texture of the croissants. Trim irregularities to make the strip uniform in width. Cut the strip lengthwise to make two 5" pieces. Mark the strip into triangles, 5" wide on the bottom. Using a yardstick as a guide, cut through the dough with a pastry or pizza cutter or knife. Separate the triangles, place them on a baking sheet, and chill for 15 to 20 minutes. Roll the dough into the traditional croissant shape, by rolling the triangle from the bottom to the point. 11) Place the croissants on a baking sheet and allow to rise for 1 to 2 hours, in which they will double in volume. 12) Preheat the oven to 425°F (220°C). Bake the croissants for 22 to 25 minutes. Allow them to cool on a rack before serving. delicious! They are nice and golden brown! Well done! Great job, they look gorgeous! 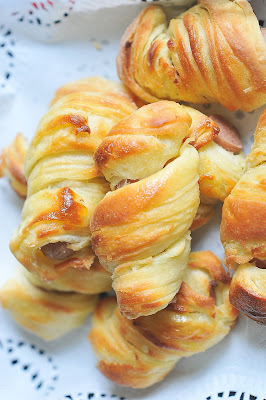 I was thinking about making the croissant recipe that the Daring Bakers made last year but this looks really good and isn't as huge of a batch. Oh my, this sounds really delicious. I bet the dough was very flaky. How nice! I love how golden they are!